Before we go any deeper into ORK Framework, we need to set up the main menu of your game – it’s the starting point for every test we’ll run! The main menu (and every other menu or dialogue) uses GUI boxes to display it’s content, so we need to set up a GUI box first. Let’s start by opening the ORK Framework editor using the Unity® menu: Window > ORK Framework. First, we’ll define the Default Screen Size we’ll use for all UI. Navigate to the Game section of the ORK Framework editor and open the Game Settings and change the following setting. Set this to X=1280, Y=800. Before we create our GUI box and main menu, we’ll also define the default GUI Skins and Audio Settings. This default settings can be overridden by each GUI box individually. Navigate to the Menus > Menu Settings and change the following settings. Since there seems to be a bug in Unity that doesn’t display GUISkins when clicking on the field, you’ll have to drag the used GUISkins on the fields. Drag the GUISkin BaseSkin on this field. Drag the GUISkin SelectSkin on this field. This skin is used to highlight a selected choice. This sound is played when you change the selection in a choice dialogue/menu. This sound is played when accepting a choice or dialogue. This sound is played when canceling. This sound is played when you try to accept an inactive choice. This sound is played when you change the level of an ability (in menus). This sound is played when you change the user of a menu. That’s it for the default settings, now we’re ready to create a GUI box. Navigate to Menus > GUI Boxes. You’ll see that a GUI box is already available and selected – we’ll edit this one. Change the following settings. Change the name to Main Menu. It’s crucial to give recognizable names to your data to distinguish them later. This will automatically enlarge or collapse the height of the GUI box to it’s content. Set X=640, Y=400, W=200 and H=200. This position (X, Y) is at the center of the screen – the default screen size is set to 1280×800. This means that the center of the GUI box will be displayed at the position defined in bounds – the main menu will be displayed at the center of the screen. The main menu GUI box is finished for now, click on Save Settings and save the changes you made. You’ll be prompted with a list of all parts that will change when saving – since this is the first time saving, the list is quite long. Confirm saving. Navigate to Menus > Main Menu (section > sub-section). Now we’ll set up the choices we’ll have in the main menu and some other settings. Change the following settings. Set to 0 Main Menu (the name of the scene we want the main menu to be displayed). This setting is used to return to the main menu scene when quitting a game. The main menu will automatically be called in the main menu scene. This setting tells ORK which scene should be loaded when starting a new game. Select the main menu GUI box we just created. 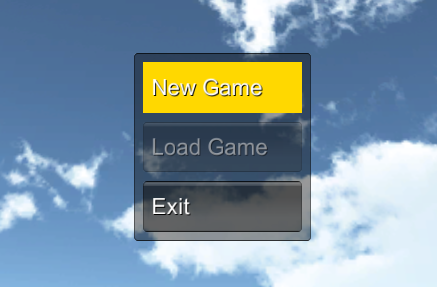 This GUI box will be used to display the main menu. Set the text of the button to New Game (or however you want to name it). Set the text of the button to Load Game (or however you want to name it). We don’t need a language button in our game. We don’t need an about button in our game. Set the text of the button to Exit (or however you want to name it). Ignore the rest of the settings and click on Save Settings. Confirm saving. Open the main menu scene (0 Main Menu) and hit play – you should now see the main menu you just created. And that’s it for now – the next lesson will cover getting a player into your game.